Machine quilting design tool News and information on the Circle Lord design tool for long arm quilting machines. Here is our new Honeycomb template. The 2 section Queen is 90 inches by 17.75 inches high. The King is 135 inches long. This template can be used on Long arm and Mid arm machines. The size of the nested cell is, 4.3" by 3.75" . Two rows are 7 inches high. The cell size of the point-on-point cell is 4" by 3.5". Two rows are 8 inches high. 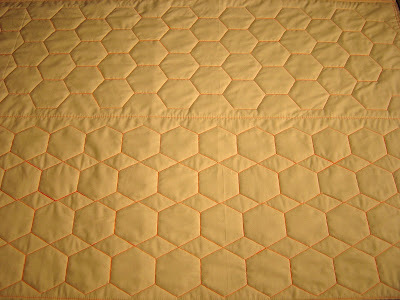 The Cells are large for quick, over all, quilting. Time is money. Cable and Rope by Carol Lyon. 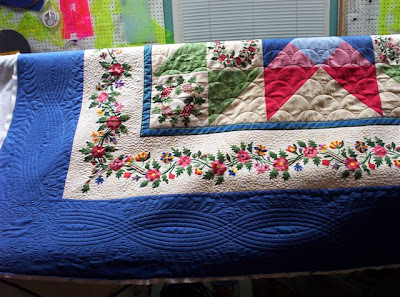 Below is a quilt done be Carol Lyon. Carol filled in with freehand Molars,or Nicole Webb's feathers. In order to get the Cable pattern, you make one pass and then move it 12 inches and do it again. Below, Carol has used it for a feather border spine. She used the CL Featherz template in the corners. It comes in two 48 inch sections and one 12 inch section. This gives you 120 inches of template. You can do 108 inches of Cable by shifting the whole template 12 inches. The template is 6 inch high by 10 ft. long. The pattern is 5 inches high. One line used as a spine is 3 inches high.